We are proud to continue our partnership with the Royal Philharmonic Orchestra, one of the world’s leading orchestras, for a concert of glorious scores and bravado featuring acclaimed conductor Gabriel Bebeşelea and one of Romania’s foremost violinists, Alexandru Tomescu. A voyage of discovery into the rich musical heritage of Romania, the concert reunites Enescu’s high-spirited Suite No. 2 and Ciprian Porumbescu’s sheer romantic Ballade for Violin and Orchestra, alongside Saint-Saëns’ inventive and impressionistic Violin Concerto No. 3 and Mozart’s final symphony, Symphony No. 41. Alexandru Tomescu has proved himself capable of taming any score, no matter how complicated, as his 'Paganini – angel or demon?' project, a turning point in his career, fully demonstrates. After studies in Switzerland with Tibor Varga and in the U.S. with Eduard Schmieder, Alexandru returned to Romania to undertake a personal mission. Through concerts and lectures, he has strived to demonstrate that classical music is a world open to all people, that it can create social harmony and that everyone deserves the chance to explore it. In parallel to a fruitful career in Europe and the world, filled with successes in halls such as Théâtre des Champs Elysees – Paris, Carnegie Hall – New York or Metropolitan Arts Centre – Tokyo, after appearances with conductors such as Valery Gergiev, Kurt Masur or Christoph Eschenbach, Alexandru has continued to actively spread this message in Romania and elsewhere and to conduct social campaigns on behalf of important cultural causes. Admired for his enthusiasm and musicality, Gabriel Bebeşelea’s reputation grew substantially and rapidly over the last years, establishing him as a fast-rising star of the conducting world. At 31 years of age, he is recognized as “one of the most gifted conductors born in the last decades in Romania” (George Enescu Festival Journal, September 7th 2011) and is winner of the first prize of the "Lovro von Matacic" Conducting Competition (Zagreb 2015) and the first prize in the “Jeunesses Musicales" Conducting Competition (Bucharest 2011). A notable opera conductor, Bebeşelea was named Principal Conductor of the Romanian National Opera of Iaşi in 2011, becoming the youngest ever Principal Conductor in Romania. In 2015 he was named Principal Conductor of the National Romanian Opera House of Cluj-Napoca. In 2014 he was presented with the “Best Conductor” award at the Romanian National Opera Houses Awards. Recent highlights that cemented his good reputation as an operatic conductor includes conducting the new production of Rimsky-Korsakov's "The Tsar's Bride" at the Perm Opera and Rossini's "Il viaggio a Reims" at the Rossini Opera Festival in Pesaro. 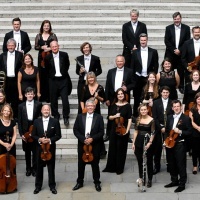 The concert is a partnership between The Royal Philharmonic Orchestra and The Romanian Cultural Institute and is kindly supported by The Embassy of Romania. 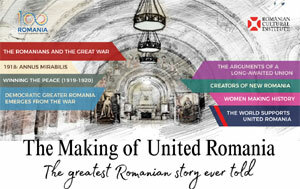 Part of the cultural programme celebrating the Romanian Presidency of the Council of the European Union.